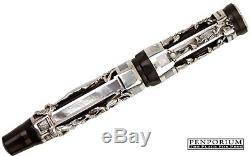 This pen does not exist anywhere in the world because Montegrappa never made a rollerball version of this pen. This pen was specially created just for Penporium and is a "one only". The unique beauty of the Aphrodite by Montegrappa is evident on first glance. Its bold size, the sculptural dynamism of its lavish, high relief overlay, the juxtaposition of contrasting materials (gleaming, matte, and lustrous), and of contrasting forms (rigidly architectural and fluidly organic) - all work together to spark an immediate fascination in the beholder, and all are classic MONTEGRAPPA. On closer inspection, one cannot help but marvel at the intricacy of detail - the various textures of bark, leaves and skin, the movement of water, the tangle of flowing hair. The figures of the Goddess herself, and of her beloved hunter, Adonis, seem to be simultaneously contained by, and also transgressing, their alcove niches, so that they manage to evoke not only their status as mythological figures of classical art and statuary, but also the fleshly human realities they represent. The item "MONTEGRAPPA APHRODITE ONE OF A KIND ROLLERBALL PEN" is in sale since Thursday, December 8, 2016. This item is in the category "Collectibles\Pens & Writing Instruments\Pens\Rollerball Pens\Other Rollerball Pens". The seller is "finepensandcollectibles" and is located in Calabasas, California. This item can be shipped worldwide.